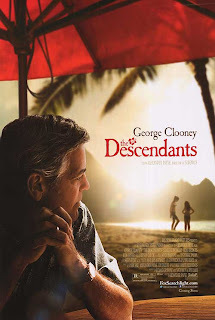 The Descendants is a film you just want to bask in. Playful, poignant and leisurely, it’s the kind of story they don’t tell enough of these days; an insightful, intimate character study populated by well-meaning people who want only to do right by those they love. So rare it is to come across a movie that allows its characters to simply exist, liberated from the rusty mechanics of plot contrivance, and talk to one another in an intelligent, frank manner. One that allows its abundance of humour to spring from behaviour and human truth, as opposed to eruptive bodily functions and dumb sitcom-level misunderstandings. When this picture flickers to a close, its characters don’t vanish into the dark, they follow you right out of the theatre. The latest unofficial entry – following About Schmidt (2002) and Sideways (2004) – in director Alexander Payne’s droll series of films focussing on flawed men who gain a new lease on life after emerging from a rut, The Descendants explores how grief can upset, and ultimately strengthen, a family. 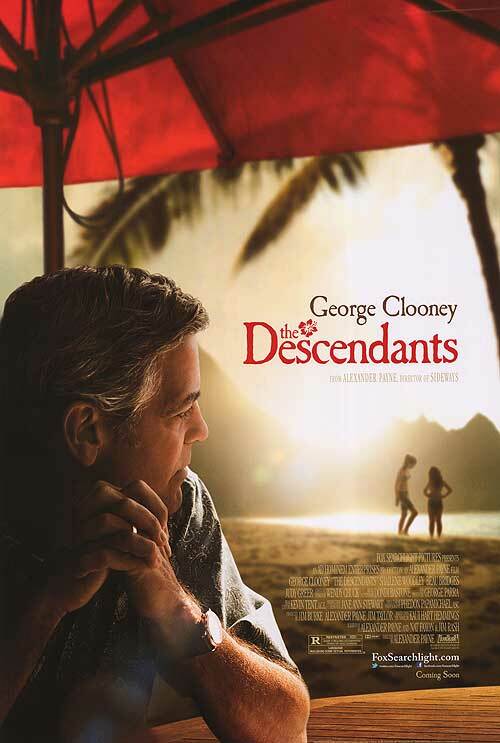 An atypically un-suave George Clooney stars as Matt King, a Hawaii-based lawyer and land baron, whose wife (Patricia Hastie) is left comatose after a speedboat racing accident. Their marriage, we learn, hit a rough patch long ago. Matt’s been consumed for years by a tremendously lucrative land deal, which will result in the sale of his family’s countless acres of lush, untouched tropical real estate. His long hours have forced her to essentially raise their two daughters single-handedly. Things soon take a turn for the worse. Matt is informed by his wife’s doctor that her condition is deteriorating and, in accordance with her living will, they are going to remove her from life support. With mere days left until the inevitable, he brings his rebellious older daughter, Alexandra (Shailene Woodley), home from private school to help take care of her sensitive prepubescent sister, Scottie (Amara Miller), while he makes the necessary preparations. However, the teenager quickly leaves Matt shell-shocked when she reveals that her mother had been engaged in an affair around the time of the tragedy. Bombarded by raw, conflicted emotions, Matt, accompanied by his children – and Alexandra’s beefy, slightly dim friend Sid (Nick Krause) – embarks on a draining, difficult mission to break the terrible news to his spouse’s family, friends and mysterious lover. Payne, an unobtrusive, low-key director, has long had a spectacular, and apparently effortless, ability to convey genuine interpersonal dynamics, and The Descendants finds him riding a career high. Collaborating with his three perfectly-cast leads, he has fashioned one of the more believable, compelling on-screen families in recent memory. The Kings may be functionally dysfunctional, but they are also smart, funny, resourceful people who truly care for and respect one another, and realize that they have to stand united in order to endure their tough situation. Payne allows their story to unfold at a deliberately calm, unhurried pace, drawing us personally into their burgeoning reconnection as a familial unit. The effect is so powerful that by the time the touching, perfect final shot arrives, you can’t help but wish you could spend another two hours in their wonderful company. The script, by Payne, Nat Faxon and Jim Rash – adapted from the novel by Kaui Hart Hemmings – takes delightful amusement in shooting down our ingrained assumptions about its characters. 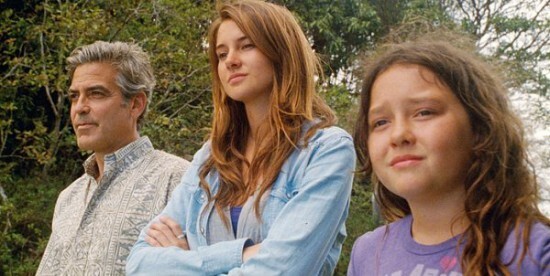 In a lazier film, Woodley’s Alexandra would be portrayed as a stereotypical antagonistic brat, snidely bickering with her father before a last minute heartstring-pulling reversal. Instead, the writers know well that, when called upon, emotionally turbulent teenagers are capable of great leaps of maturity and selfless sacrifice. They also give fascinating depth and dimension to their considerable stable of supporting players, including Robert Forster, who earns the film’s biggest laugh as Matt’s fiercely proud father-in-law, and Beau Bridges, as a leading member of the King clan who is hugely invested in the land sale. Heck, even Sid, juvenile and awkward as he may be, ain’t such a bad kid after all! Rising to the classy occasion, George Clooney gives one of his most accomplished performances. Long celebrated as one of our top-ranking modern movie stars, it’s rare anyone takes the time to acknowledge what a giving actor he is. A less secure performer might vie for attention, surrounded by a cast of this pedigree, but Clooney is confident enough to play understated and let his co-stars steer the scene. You can sense real trust between him and his inexperienced on-screen daughters, Woodley – who has a blindingly bright future ahead of her – and Miller, and his performance benefits immensely from their natural shared chemistry. It’s worth noting how much of Clooney’s stand-out work is nonverbal. There’s a fantastic moment in a bar and grill where, after receiving some shocking news, Matt temporarily disengages from everything around him. 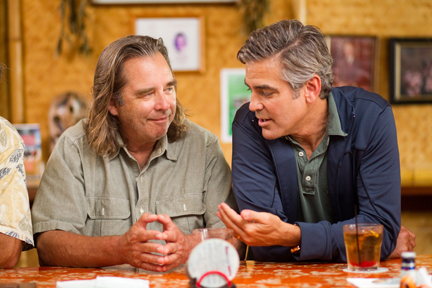 In Clooney’s anxious, dazed mannerisms, you can feel him fighting valiantly to maintain his composure. Conversely, he hilariously drops all shreds of his characteristic cool is an inspired comedic bit frantically racing down the street in flip-flops. Payne calls on him for true fireworks, though, in a pair of scenes in his wife’s hospital room, the latter of which will likely receive considerable (and deserved) airtime at the next Oscar ceremony. Given the craftsmanship and sophistication on display in The Descendants, it’s a hard to figure out how the unnecessarily longwinded opening narration ended up tacked onto the first fifteen minutes. Rarely has such a dizzying amount of exposition been dumped in such a breathless amount of time. It seems strange that Payne – a helmer who can be counted on to have faith in his audience – would choose to include such a shockingly on-the-nose voiceover. Still, it’s easy to forgive such a brief misstep when there’s so much to treasure. To watch this picture is to witness a masterful filmmaker joyfully fashioning a brand of beautiful entertainment that only he’s capable of achieving. Coming in the last few weeks of a troublingly spotty year for quality cinema, The Descendants is a sunny little cinematic oasis that’ll leave you feeling charmed, moved and beaming ear-to-ear.